This accreditation is awarded after applicants have completed an extensive training programme for trainers and undergone a rigorous assessment of their trainer competency. Similarly, EMDR Training with Gus Murray is an EMDR Europe Accredited Training. This accreditation is awarded after the training programme has undergone a rigorous assessment of its content and structure. 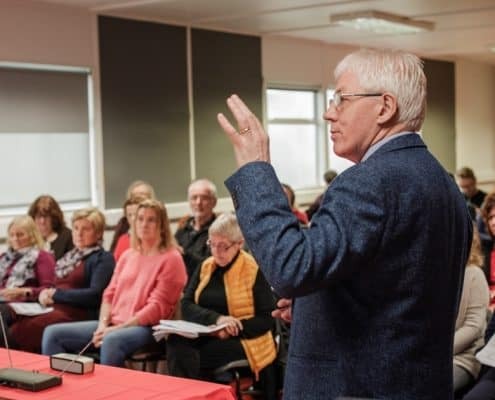 EMDR Training with Gus Murray will satisfy the training requirements to enable graduates to seek professional accreditation as an EMDR practitioner. Towards these ends, the training includes a combination of interactive theoretical input, demonstration, skills practise, supervision and case consultation. EMDR training comprises an integrative combination of Teaching, Supervised practice (Practicum) and Clinical Supervision. The Training is delivered in 3 modules interspersed with clinical supervision meetings as well as opportunities for practise and guided reading. The Training is delivered in three modules interspersed with clinical supervision meetings as well as opportunities for practise and guided reading. Each module is approximately 2.5 days. In conjunction to the main training modules, trainees will receive a further 12 hours of supervision, case consultation and integration in small groups. These will take place in scheduled sessions between modules one and two and modules two and three. One final review and integration session will be scheduled after module three is completed. The cost of the full training (including Supervision/Consultation during the training) is €990.00 which will be payable in three instalments.